Please note: Descriptions below are relevant only to the previous consultation held in autumn 2018, and do not form part of the current design refinements consultation material. It is included here for reference. Section H was largely urban. It spanned Spelthorne Borough Council and ended just within the London Borough of Hounslow. The section is around 7km and starts after the trenchless crossing of the M3, following Littleton Lane north, before crossing the B376. It then goes north to the western edge of the Queen Mary Reservoir, at which point there are two sub-options. After crossing the Staines By-Pass (A308), the section continues north, crossing the Waterloo to Reading railway line close to Ashford Station, where there are three sub-options. All sub-options will have different impacts for landowners and residents and will meet up to cross under the A30 using trenchless techniques, finishing at the West London Terminal storage facility in Hounslow. Following ongoing engagement with landowners, consultation feedback, and early involvement with contractors to review our proposals, we have deselected both sub-options. 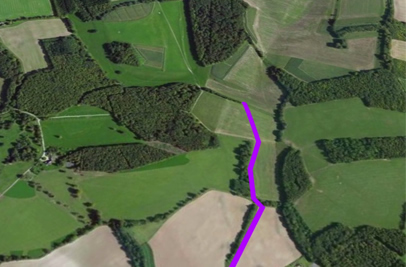 We have identified an alternative option for the area to reduce the impact on the narrow residential roads along H1b and avoid major engineering challenges from H1a (such as installing close to the edge ofthe reservoir, alongside a major gas main and overhead power lines). H1a was favoured by local residents and met our preference to install on private land and away from public roads, but there wereconcerns about the reservoir from an engineering and logistics perspective, as there is a bund (small embankment) that would cause issues for the installation of the pipeline. H2c was selected because it is the most feasible option from an engineering perspective and consultation feedback confirmed concerns about the other two options in this area. H2a was deselected due to engineering constraints identified through further technical work. This included an assessment of the angle of the railway crossing that would have made installation very difficult, and the proximity to a road bridge over the railway that would not have provided a large enough space for installation. Consultation responses included concerns from local residents around the space needed for safe installation. H2b was deselected based on strong opposition from consultation feedback, raising concerns about the impact on local businesses and the car park at Ashford Station. Following the selection of H2c, we have identified an area of the route along Station Approach that could be used to improve traffic flow around Ashford Station and reduce the impact on the roundabout along Woodthorpe Road near to the station. H3b has been selected because it is a more direct and shorter option. The selection of H3b was closely linked to the selection of H2c.